The Indian nanny who rescued Jewish toddler Moshe Holtzberg from the clutches of terrorists during the Mumbai attacks, may be conferred a top Israeli honour usually reserved for saviours of Jews from Holocaust. Moshe, the orphaned son of Rabbi Gavriel Holtzberg and his wife Rivka, reached in Jerusalem in a special Israel Air Force aircraft last night which also brought the governess, Sandra Samuel. The Jewish couple were killed during the terror siege of Nariman House where they ran a cultural and outreach centre for the ultra-orthodox Chabad-Lubavitch movement. Samuel, lauded a hero by the Chabad movement and Moshe's family for saving the child, could be conferredthe "Righteous Gentile" award that could facilitate herstay in Israel, media reports said. The special honour is usually reserved for those who risked their lives to save Jews from the Holocaust. Samuel, 44, had worked at the Chabad centre for about five years andstarted caring for Moshe who had become "extremely connected to him". As terrorists stormed the Chabad centre last week,Samuel locked herself in a room with another staff member. The following morning, she heard Moshe calling her name and went to look for him. She found Moshe, his pants covered in blood, crying beside his motionless parents. 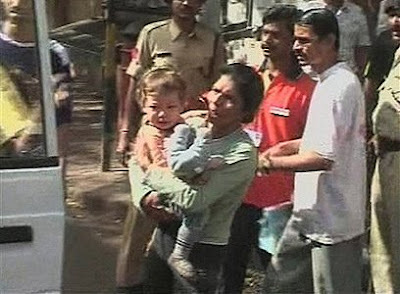 The Indian nanny toldreporters that she grabbed the child and ran outside. Terrorists continued the siege of Nariman House for the next two days, killing several hostages before being gunned down.